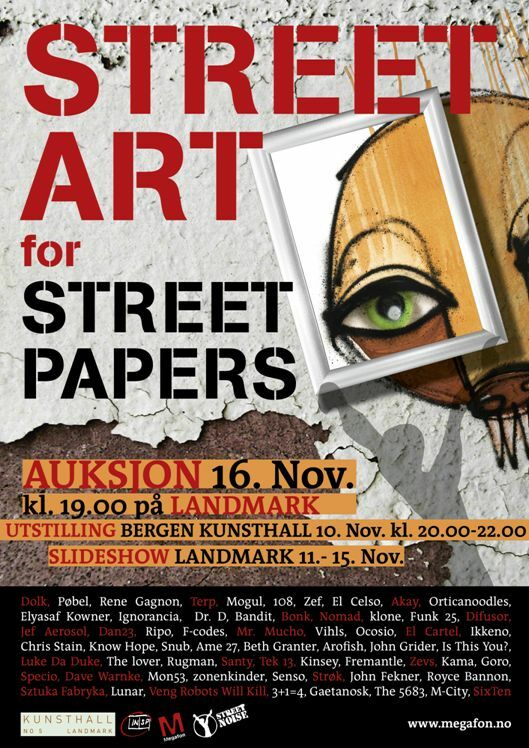 A piece of my art is in an auction tomorrow (Sunday 16th November) in Bergen, Norway, for street paper charity Megafon. Check it out if you’re about that way… not sure how many people who read my blog will be able to go! Details here, but in Norwegian! Just popping in to tell you that the Street Art for Street Papers-auction yesterday was a success, and that I’m now the proud owner of your digital print. Googled you when I came back home, and here you were 🙂 A brilliant piece you made, and I’m looking forward to get it up on my wall. I’ll ad a picture of it on my blog when I’ve collected it. Thanks for donating your art to such a great cause!